You need to know some information about authorization to pass the compTIA A+ Certification Exams. After a user logs on and an access token is created, the user may start trying to access resources such as files and printers. To access a file, folder, or printer on the network, the user must be authorized to access the resource. Authorization is the process of giving a user permission to access a resource or the right to perform an OS task. Do not confuse authentication and authorization: You must be first authenticated to the network; then, after authentication, you can access the resources you have been authorized for. To authorize access to a resource, you set permissions on the resource. 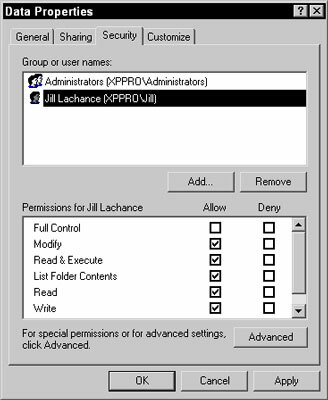 For example, if you want to allow Jill to access the accounting folder, you need to give Jill permission to the accounting folder, as shown here. Using permissions to authorize which users are allowed to access the resource. Here, you can see that the Administrators and Jill have access to the resource. No one else is authorized to access the resource. Make sure you understand the difference between authentication and authorization for the certification exam. In the Windows world, there is a difference between permissions and rights. Permission is your level of access to a resource. Comparatively, a right is your privilege to perform an OS task. For example, you can be assigned the right to change the time on the computer. Other examples of rights are the right to do backups or the right to log on to the system.